All professionals at Prairie Sinus Ear & Allergy PC maintain the highest levels of accreditation and pursue ongoing education to stay abreast of the latest trends in the medical field. Read on to learn more about our staff's experience and training. 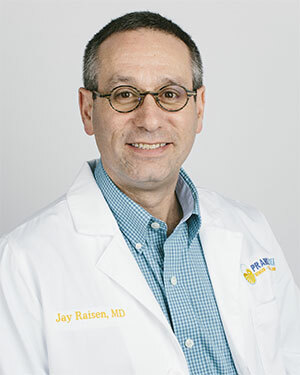 Dr. Jay Raisen, M.D. joined Prairie Sinus Ear & Allergy in this new practice opening in the summer of 2017 after working in Bismarck and Fargo North Dakota since 2008. He is a specialist in Otolaryngology. His professional interests include advanced endoscopic sinus surgery, balloon sinuplasty, nasal allergy, sinus and nasal disease, swallowing problems, ear surgery, and general Otolaryngology. Dr. Raisen is Board Certified by the American Board of Otolaryngology. He received his medical degree from the University of Toronto and completed his residency in Otolaryngology at Dalhousie University in Nova Scotia. Dr. Raisen is licensed in the State of North Dakota, a member of the Department of Surgery at CHI - St. Alexius Medical Center, member of the American Academy of Otolaryngology - Head and Neck Surgery, and member of the American Academy of Otolaryngologic Allergy.